Following the confirmation at least 60 cases of Lassa fever, the Federal Government has raised the alarm and activated emergency response centres. The government's action signals the official declaration of the outbreak of the disease. The Director-General of the Nigeria Centre for Disease Control (NCDC), Dr Chikwe Ihekweazu, said in a statement there had been an increase in cases across the country since the beginning of 2019. "As at 13 January 2019, a total of 60 confirmed cases have been reported in eight states." Epidemiological data show that the trend usually occurs during the dry season - between January and April. 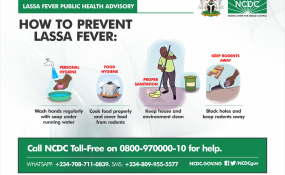 "Given this increase in reported cases of Lassa fever, the Nigeria Centre for Disease Control (NCDC) has declared this an outbreak and activated an Emergency Operations Centre (EOC) to coordinate the response." The national EOC is comprised of representatives from the World Health Organisation (WHO), Federal Ministry of Agriculture and Rural Development, Federal Ministry of Environment, US Centres for Disease Control, as well as other partners. He explained that NCDC has been providing support to states, including the provision of emergency supplies and deployment of Rapid Response Teams (RRT). The RRTs, he said, would work with states in "response coordination, contact tracing, case management, risk communication, as well as strengthening infection prevention and control practices". "Since the Lassa fever outbreak in 2018, NCDC has worked with states to ensure better preparedness and improved response," he stated. "In the last one year, guidelines have been revised, new data management tools have been developed and the laboratory network has been strengthened. "Additionally, risk communications have been strengthened through radio, posters, flyers and social media. A national research plan has been developed, to enable its full integration into the outbreak response to gain a better understanding of the disease." Lassa fever is an acute viral haemorrhagic illness, transmitted to humans through contact with food or household items contaminated by infected rodents. Person-to-person transmission can also occur, particularly in a hospital environment in the absence of adequate infection control measures. Healthcare workers in health facilities are particularly at risk of contracting the disease, especially where infection prevention and control procedures are not strictly adhered to. He advised Nigerians to focus on prevention by practicing good personal hygiene and proper environmental sanitation. He also advocated effective measures which include storing grain and other foodstuffs in rodent-proof containers, disposing of garbage far from the home, maintaining clean households, and other measures to discourage rodents from entering homes. "Healthcare workers are again reminded that Lassa fever presents initially like any other disease-causing febrile illness such as malaria, and are advised to practice standard precautions at all times, and to maintain a high index of suspicion." "Rapid Diagnostic Test (RDT) must be applied to all suspected cases of malaria. When the RDT is negative, other causes of febrile illness including Lassa fever should be considered. Accurate diagnosis and prompt treatment increase the chances of survival."